Living in the Northeast does not present a lot of options for cold weather camping. 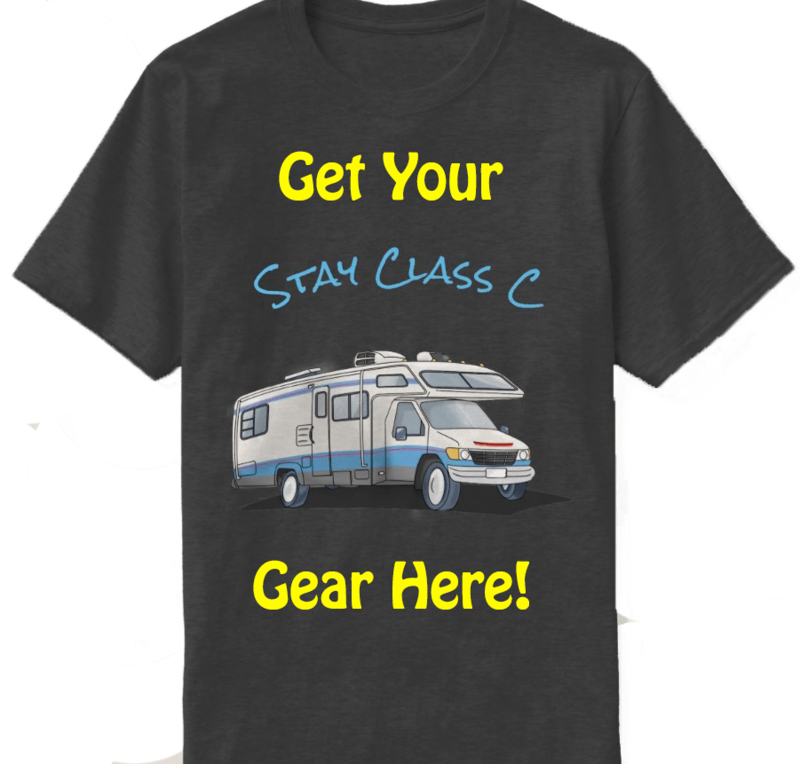 There is a handful of RV parks open year round but unless you intend to keep your rig at the park, most folks store their motorhomes for the winter. This is our third year storing Lady T and we feel we have a pretty good handle on the winterizing process. Ideally, we would like to store her indoors but after doing much research, we found that our options are limited (and expensive!) in our area. The following is a detailed outline of the steps we go through to prepare and store Lady T for the offseason. The tips and instructions included in this article are meant to be a guide and give others an idea of what should be done and the extra steps we take to ensure our lady is protected during her winter slumber. We’ve received several compliments about Lady T’s condition and we’re very proud of the things we’ve learned and accomplished in the last couple of years We hope that you will find this information helpful and we welcome any feedback! In the spring of 2014, we installed a small solar panel on the roof to help keep our house battery topped off when not in use. Since it is possible that the weight of snow could damage the solar panel, we remove it before putting the cover on. Last fall, we purchased a couple of mini trickle chargers, also solar, and we hook those up to both the house and truck batteries. These are mounted to a couple of 5-foot wood planks so they stay above the snow drifts in the yard. 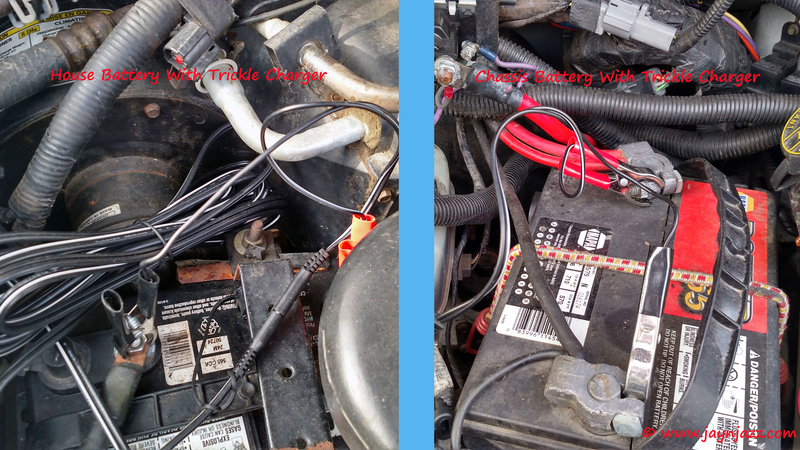 Trickle chargers connected to batteries. Next, we remove the bike rack mounted to the trailer hitch on the back of Lady T. Although the RV cover would probably fit over this, we remove it to prevent holes forming in the cover caused by the constant rubbing of the cloth against metal. We had to patch up a couple of holes that formed around the exhaust pipe after the first winter and we have done our best to minimize further damage to our investment in the RV cover. The hot water heater should be flushed before storing your rig so that any extra sediment, dirt or debris is flushed out of the system. Leaving these things in for long periods of time could cause damage to the heater and/or your water lines. This is the first year we flushed our unit and it did look a little cloudy as we flushed it. We have an Atwood model and it comes with a plastic drain plug, which makes the process a bit easier. Also, we discovered while on our Route 66 trip that our unit does not use an anode rod, which is meant to attract corrosive elements in the water. We recommend you check the manual for your model to determine if one is present. There wear over time and can be replaced rather easily. We use a wand attachment with a small spray nozzle on the end to thoroughly clean our marine toilet before emptying the black water tank. If you try one of these, be sure to rotate it often to make sure you reach the sensor and all areas of the tank. 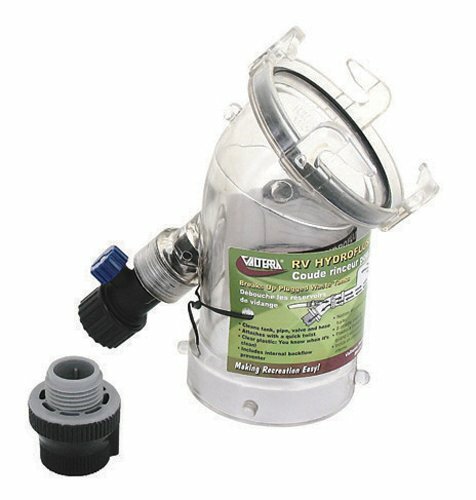 This year, we also purchased a Hydroflush valve attachment that connects to the exterior drain valve and attaches to the sewer hose. The valve allows you to spray water up inside of the tanks and the clear attachment enables you to see when the water runs clear. As a rule, we always do the black tank first and then the gray water tank. Draining the fresh water tank is essential to preventing damage caused by the expansion of frozen water in the lines. We empty the fresh water tank as completely as possible and then add about two and a half gallons of RV antifreeze. We then cycle it through the lines to ensure that the pipes won’t freeze. To go even further, you can purchase a gadget called a “blow-out plug”, which attaches to your shore water intake and allows you to attach an air compressor to blow out excess water. We bought one of these recently and plan on trying it out next year. Even when the awning is rolled up, it will collect water during the warmer months. Keeping that water in the awning all winter can cause staining and foul odors. Make sure to fully open your awning to allow it to completely dry before covering and storing your rig. This goes for any slide out awnings as well. Of course, you should also give your rig a thorough bath before storing it. This ensures that dirt, bugs, and other debris is removed before its covered. It also makes detailing much easier in the Spring! We also store our removable wheel covers in the garage to keep them from rusting. By stuffing steel wool in your engine exhaust and generator exhaust pipes, you can block out any critters looking to make a home for the winter. Critters nesting in the pipes and cause damage and prevent exhaust fumes from escaping when you cycle your engine or generator during the winter months. Steel wool just doesn’t taste good and blocks access to the pipes. Use in the gas tank to keep fuel fresh. When storing your RV for a long period, it’s a good idea to make sure the fuel tank is full. 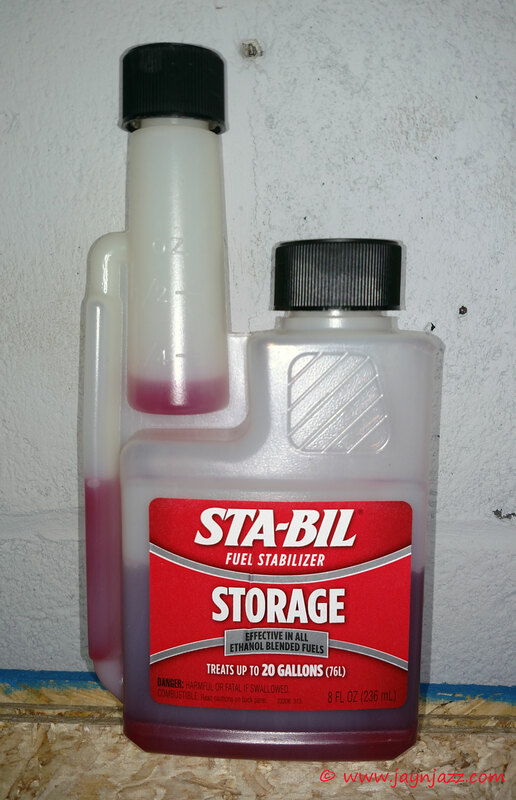 We also recommend using a fuel additive, such as Sta-Bil. It’s important to let the rig run for several minutes to ensure the additive cycles through the lines completely. Our generator runs from the same tank as the engine, so we run the generator for a bit as well. Keeping the fuel tank full reduces the amount of air and moisture in the tank. The same is true for the propane tank. Make sure to check your basement for any liquids that can freeze, such as cleaners, and remove any other items that should be stored inside for the winter. We also add dryer sheets and rodent repellent (see below). We completely clean the interior before storing Lady T for the offseason. Windows, floors/rugs, appliances, furniture, cabinets, toilet/shower, and front cab. We also remove all bedding to wash and store for the winter. Believe it or not, dryer sheets are one of the most important items on our winterizing checklist! For some reason, mice hate the smell of dryer sheets. Last offseason, we learned the hard way that you can’t use just any dryer sheets. The first time we stored Lady T, we used Bounce brand and there was absolutely no sign of critters the following spring. Last year, we used a generic brand and when we opened up Lady T this past spring, we got quite a surprise. Mice had infiltrated every cabinet and every drawer in our rig, leaving behind a nasty layer of poop. Also, they used our marine toilet paper to create nests in several different spots. In this case, it’s totally worth it to buy the brand name. Make sure to stuff the Bounce sheets in every nook and cranny to deter those destructive little poop machines! Dryer sheets, air freshener and moisture absorber in the bathroom. In our research, we also discovered a natural rodent repellent called Fresh Cab. We didn’t want to use traps or poison so we purchased a bunch of these and placed them in several spots throughout Lady T. They smell great and we found no additional evidence of mice throughout the summer. Additionally, we purchased a couple of covered storage bins and used them to store everything from the drawers and cabinets. This includes cookware, dinnerware and the contents of our utility drawers. We left the bins inside Lady T but placed a weight on top of each to keep any critters out. 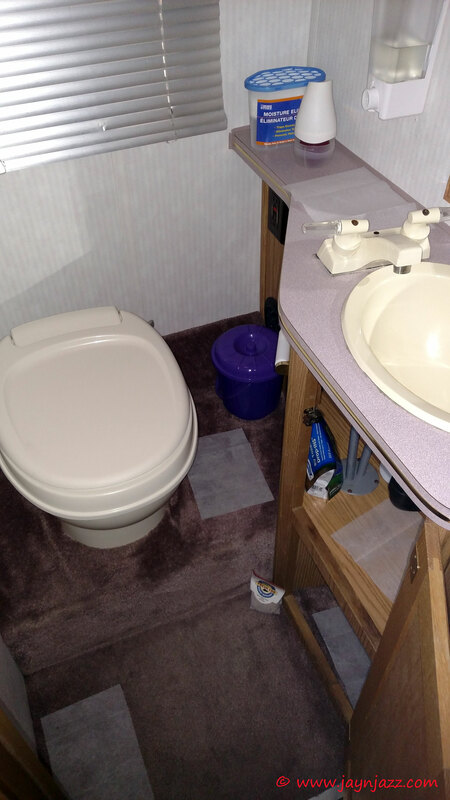 The last thing we do inside is add another gallon of RV antifreeze, pouring some into the sink and shower drains. It is important to reach the P-trap in the pipes, where a small amount of water may collect and freeze when the temp drops. Check out the pics and videos below and thanks for reading! Click on the photos to open in a gallery.